Upland sandpiper. Photo courtesy of Washington Department of Fish and Wildlife. 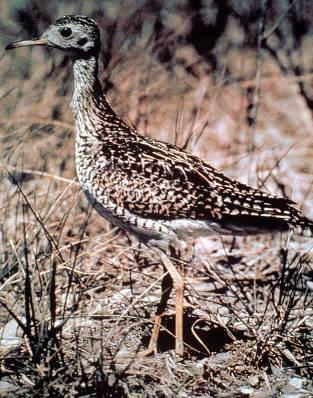 The upland sandpiper may be extirpated as a breeding species in Washington. It is a medium-sized sandpiper that nests on grassland in North America, and winters on the pampas of South America. There are scattered historical breeding records for eastern Washington, it may have never been abundant, and apparently was rare throughout the 20th century in Washington. Habitat loss to development, grazing, and invasive knapweeds all may have contributed to the species’ extirpation from the state. A few birds nested in the Spokane Valley during the 1950s-1990s (McAllister 1995), with the last nesting record in 1993. The last sighting of an upland sandpiper in Spokane County was 2004. It is also apparently gone from Idaho (Mlodinow 2005). McAllister, K. R.1995. Washington state recovery plan for the upland sandpiper. Washington Department of Fish and Wildlife, Olympia, Washington. 50 pp. Mlodinow, S. G. 2005. Upland sandpiper. Pp. 145 in T. R. Wahl, B. Tweit, and S. G. Mlodinow, eds. Birds of Washington: status and distribution. Oregon State University Press, Corvallis, Oregon.